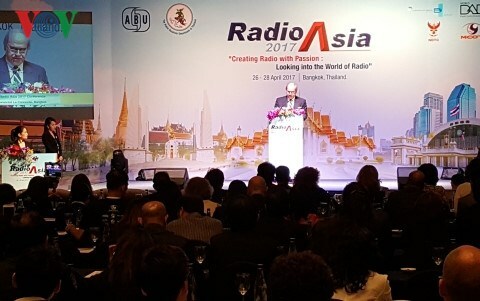 Bangkok (VNA) – A delegation of national radio broadcaster Voice of Vietnam is representing the country at the RadioAsia Conference 2017 that opened in Bangkok, Thailand, on April 26. The three-day event, organised by the Asia-Pacific Broadcasting Union (ABU), attracts hundreds of delegates who are workers in the radio broadcasting industry and communications specialists from all over the world. In the opening speech, ABU Secretary-General Javad Mottaghi said this year’s conference is important as the radio broadcasting industry are facing challenges posed by other types of media and social networks. If the industry does not make changes to adapt to the public, it will be left behind. Therefore, the 2017 conference is themed “Creating Radio with Passion: Looking into the World of Radio,” he noted. At the meeting participants gave opinions on the development of radio broadcasting in the new era, the application of digital technology in the industry, and radio broadcasting on mobile devices and social networks. Minister of the Thai Prime Minister’s Office Panadda Diskul said radio broadcasting remains an indispensable type of media, and the Thai Government still pays attention to it. Radio has helped many people access information in a convenient and easy manner.